Every time I see a copy of this book, Let Me Listen To Your Heart, in the thrift store or yard sale, I grab it so I can send it to someone who might appreciate it. 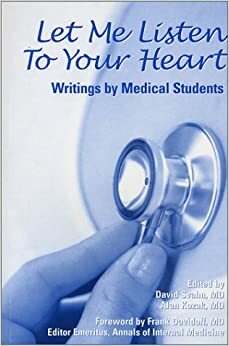 This book of short writings by medical students in Cooperstown is poetic, poignant, and beautiful. What a stupid, stupid question. I know how you are — sick of freshmen like me practically giddy from my expensive education. You’ve seen me before…. Oh, yes, I have seen you before and put up the walls you describe your essay. But the young doctor goes on to describe finally connecting with the patient. It’s a theme in the book. Listening. Moving beyond a list of memorized symptoms and linear diagnosis, to seeing a person. To hearing a person. In another essay** the woman writer describes an ER patient being admitted for an overdose on a cold and rainy night. He had been referred to as a “scumbag”, which conjured up all sorts of images, before she actually met him. [He was a]… scrawny little guy, with half-an-inch thick glasses and pretty bad acne…. I liked him immediately, almost instinctively — kind of the way you would like puppy that’s smaller and weaker than the others and has a really tough time getting its share of food. The “scumbag” has long since drifted away, and I’m left sitting with a sad and lonely child. It’s raining again. I was filled with the feeling that I had done something useful by finding the patient within the illness. And there to prove it, on the seat next to me, in the form of a hand plane, lay my first, unsolicited, fee. My father came home with many such “fees” — fresh eggs, small paintings, handmade dolls for me and my sister. When a doctor connects with his patient by seeing him or her as a flesh-and-blood person with history and future, who has a family, and work, and feelings, it can make all the difference. I’m grateful that Bassett compiled this book back in 2002. If you should see it somewhere, I suggest you grab it.